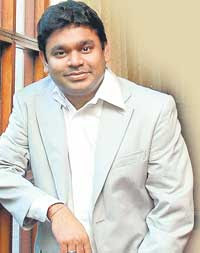 Recent news doing the rounds is that the Mozart of Madras, A R Rahman, who hadn't worked in any Mollywood flick after his debut film 'Yoddha', will be soon seen again in Malayalam soon. But that will be in a different avatar. The buzz is that the ace musician will be playing a role on screen in the latest Mammootty flick, 'Track with Rahman' to be directed by Jayaraj. The movie to be made simultaneously in Tamil, Malayalam and Hindi, will have the megastar as an investigative officer, who is in Mumbai to track the reality behind the mysterious death of an young man who landed in Mumbai to sing a track for a famous singer. The film is expected to roll in a couple of months.